Sally Barkow of Team Magenta 32 was pulled up yesterday for swearing live on camera at the World Match Racing Tour in Copenhagen, so she has resorted to an angry growl as her family-friendly alternative to letting off steam. There was plenty of growling from the Team Magenta 32 skipper this afternoon, but plenty of grinning too in her ding-dong match against Johnie Berntsson's Flux Team. As the previous M32 Tour event in Fremantle proved a few weeks ago, the lead changes in a catamaran match race can be far in excess of what we saw on the old format Tour in monohull keelboats. There were twists and turns in the duel between Ian Williams and Australian Evan Walker, particularly in the second match. The reigning World Champion was all over the young Aussie in the pre-start, shutting him out of the start line and surging to a massive, impenetrable lead. Or so it seemed, because the breeze - although averaging 12 knots - was fickle and shifty and Williams seemed to fall out of phase towards the final top mark. Walker closed the gap and found himself within striking distance down the final run when he managed to roll GAC Pindar for the most unlikely of comeback victories. That said, Williams still sits on match point with a 2-1 lead this evening. Taylor Canfield leads Sam Gilmour 2-0, and it’s 2-0 so far for Yann Guichard and his Spindrift racing crew against Michael Hestbaek. But the Olympic Dane is dangerous and remains optimistic that he can overturn the Frenchman’s advantage. 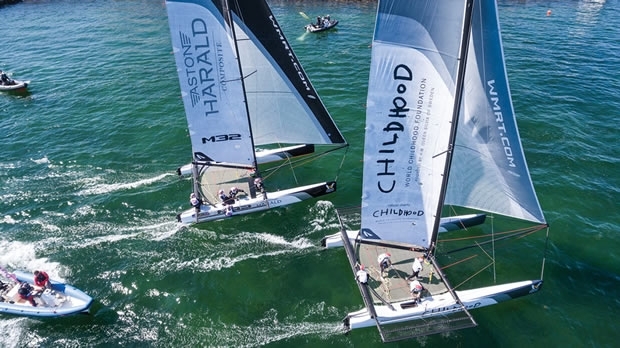 In his earlier battle with Hans Wallén, he dispatched the Fremantle finalist 2-0, so Hestbaek shows that he fears no one despite his lack of M32 match racing experience. Volvo Ocean Race veteran Bouwe Bekking made an appearance at the event today, catching up with his former Volvo rival Iker Martinez, who was one of those that didn’t race today. The Spaniard’s turn will come tomorrow when he goes up against the young Kiwi Chris Steele and his 36 Below Racing crew. The 49er Olympic Champion is sailing with a very experienced crew that includes his former Luna Rossa America’s Cup team mate Pierluigi de Felice, Volvo Race veteran Pablo Arrarte and up and coming 49er talent Diego Botin. “The Tour is a great place to be, the boats are super exciting and these events have the right profile for our sponsors," commented Martinez. "Now we just have to learn the art of match racing, because there is not much history of match racing in Spain.” With multiple matches per day, Martinez couldn’t have found a better place to learn his trade. Thursday sees the conclusion of the Super 16 racing to determine which of the original 20 teams makes it through to the Quarter Finals in sunny Copenhagen.